Poly(p-phenylene vinylene) (PPV) or oligo(p-phenylene vinylene) (OPV) is one of the best known p-conjugated materials. The preparation of fiber-like OPV or PPV-containing micelles with control in nanometer scale over the length and composition is considered to be the most fundamental step for building more complex, but predicable architectures. However, to date the preparation of fiber-like OPV or PPV-containing micelles with control over the length and composition have not been realized yet. Huang’s group from Shanghai Institute of Organic Chemistry of the Chinese Academy of Sciences have successfully developed a new strategy of “living” crystallization-driven self-assembly to prepare monodisperse cylindrical micelles of controlled length and composition with oligo(p-phenylene vinylene) core . The average length of cylindrical micelles with a narrow length distribution can be tuned up to ca. 870 nm by temperature-induced self-seeding strategy (see Scheme below). In addition, the seeded growth route was not only employed to prepare monodisperse cylindrical micelles with controllable length and narrow length distributions, where the length of obtained cylindrical micelles were consistent with the predicted value for cylindrical micelles as a function of the ratio of unimer-to-seed, but also prepare cylindrical triblock A-B-A co-micelles with the same OPV-core (see Scheme below). 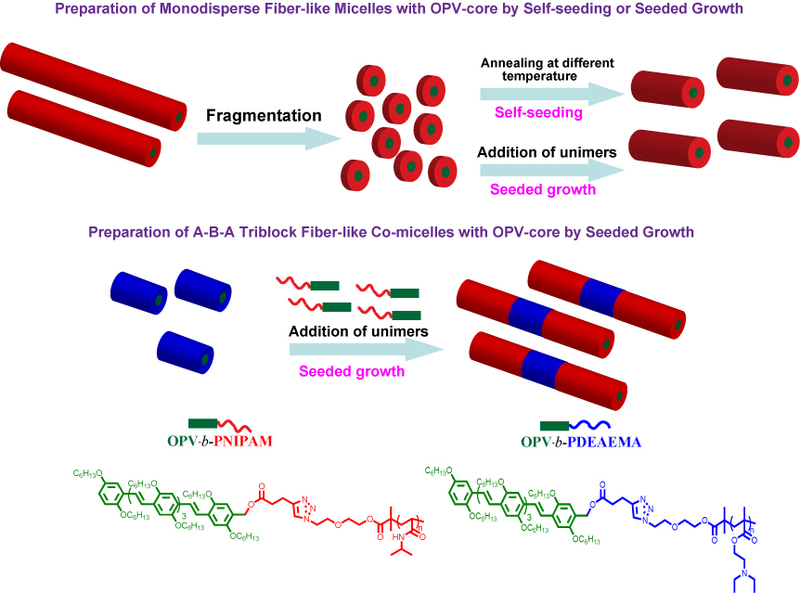 Illustration of the preparation by CDSA of uniform fiber-like micelles and A-B-A triblock co-micelles with an OPV-core (Image by Huang’s group). The preparation of OPV-based hierarchical architecture is of considerable interest due to the broad applications of OPV in solar cells and light-emission diodes. Fortunately, given the versatile and robustness of seeded growth strategy of CDSA in the preparation of fantastically hierarchical architecture, the successful extension of seeded growth” route to other p-conjugated copolymers should make the formation of segmented block co-micelles as well as other complex hierarchical architectures with p-conjugated polymer core feasible. This work was financially supported by National Key Research & Development Program of China, National Natural Science Foundation of China, Strategic Priority Research Program of the Chinese Academy of Sciences, Youth Innovation Promotion Association of Chinese Academy of Sciences, and Shanghai Scientific and Technological Innovation Project.